Bill Nye putting the torch to CNN! Hurricane Shmurricane, Billy Nye don’t care about your Hurricanes. Facts are facts because of very important characteristic: THEY ARE FACTS. Check out Bill’s “I can see right through you” face, S.E. Cupp just pissed her pants. Hey SARAH, yeah I read your Wiki page, if you mess with the bull you’re going to get the horns. Do you really want to argue with a scientist? The man who taught me everything I know? Look elsewhere for an easy win, you ain’t gonna get it here. PS- How dare S.E. Cupp say Bill Nye is bullying people. He could barely get a word in. Posted on May 8, 2014, in Average Blog Posts and tagged bill nye, cnn, cross fire, crossfire, SE CUPP. Bookmark the permalink. 5 Comments. CNN annoys me at times. They don’t want to listen to the science side of things when they say they want to. 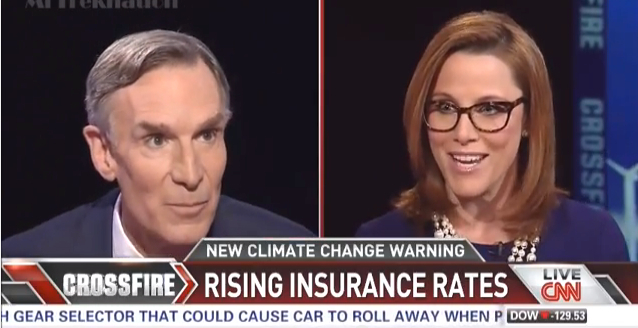 How is lil ol Bill Nye “bullying” a conservative economist? They’re not even giving the guy a chance to talk. Just because he didn’t do well on Dancing with the Stars, it does not mean he is not intelligent… Frankly, his lack of dancing ability proves his brain is where it’s at. After all… economists, liberal or conservative, know a lot about nature and devastation. Nye touches upon economic cost, but they sweep that away as well. Once a childhood hero always a hero.